With a classy name like Vanderbilt, you’d expect that this 19th century mining camp would have had streets lined with gold or at least silver—but they were dirt and mud. In fact, despite its promoters best efforts to develop a successful mining camp, Vanderbilt, which also went by the name, Vanderbilt City, never amounted to much more than unfulfilled promise. The town was formed in 1870 after the discovery of promising silver-lead reserves in the surrounding area, which was called Secret Canyon. Within a short time, a small community cropped up near the Vanderbilt Mine (hence the name). Within six months, Vanderbilt had about 150 residents, saloons, boarding houses and a couple of stores. Additionally, a ten-stamp mill was moved to the area from Hot Creek in Nye County and another facility, called the Sierra Mill, was constructed. In August 1871, Vanderbilt seemed sufficiently substantial that a post office was opened. The optimism was to be short-lived. Nearby Eureka was starting to boom and many of Vanderbilt’s residents decided to move on to the bigger camp. Soon, ore from Vanderbilt’s mines was also being shipped to Eureka, so the Sierra Mill was shut down. The mill was sold a few times, then destroyed in a fire in late 1872. The fire signaled the end of Vanderbilt. The post office closed in summer 1873. Individual miners continued to work the local mines during the next few years and there was a small boom in 1880. During this latter period, the town’s name was changed to Geddes, after Sam Geddes, owner of most of the local mines. The post office was reopened and Geddes and his partners built a massive 20-ton mill and furnace at a cost of $300,000, in anticipation of great profits. While Geddes’ company was able to pull more than twice that in ore production, it took more than 20 years. The camp muddled along through the 1880s, with the post office again closing in 1885, but the beginning of the end came in 1886, when the newer mill and furnace was destroyed in a fire. Only small scale mining took place in the area after the late 1880s. Today, Vanderbilt/Geddes is little more than a minor footnote in Eureka County’s rich mining history. The drive to the camp winds on a rough dirt road through a fairly steep canyon, located about five miles south of Eureka. A few miles from Eureka, you can look up the side of a hill and spot a couple of wooden head-frames and the remains of a large ore bin. A bit further up the road, you come to a large tailing pile and the considerable ruins of the 1880 Geddes mill and furnace. If you explore the site, you can find well-crafted stone walls, cement foundations and assorted rusted metal chutes, bolts and other mining paraphernalia. Across the hill from the mill site, you can spot the remains of two stone buildings. The structures, built into the hillside, were made using local shale rock and wood. One still has a small window and frame. Additionally, if you drive on the dirt road that travels above and behind the mill site, you can find the remains of two more intriguing structures. One appears to be the ruin of a fairly significant house with a brick chimney and interior walls covered with plaster. The other is a more intact stone structure—although not enough is left to indicate if it was a house, store or storage building—built on the cliff overlooking the canyon. The view is spectacular but, strangely, its builders didn’t put in any windows to take advantage of the location. To reach Vanderbilt, travel 1.5 miles east of Eureka on U.S. 50, then turn right onto an unmarked, winding dirt road (it’s called Secret Canyon Road). Continue for four miles to the former town site. 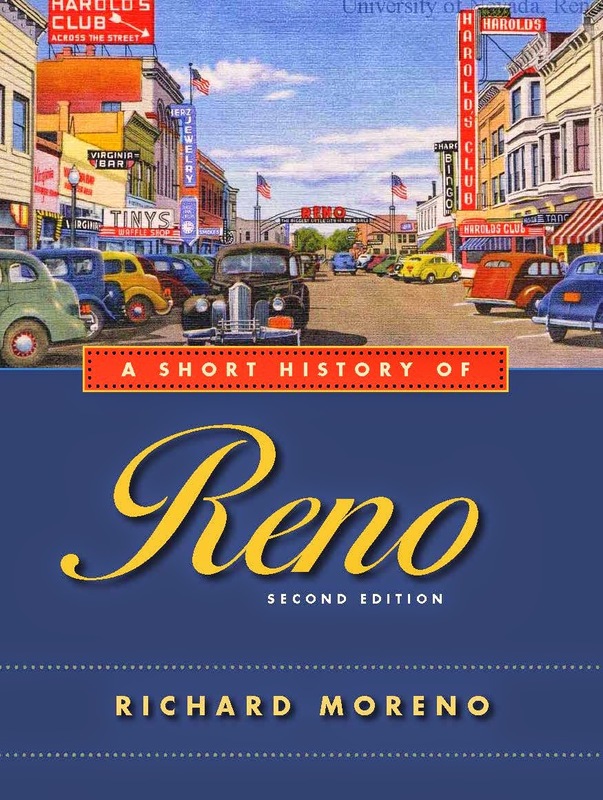 For more information on Vanderbilt pick up a copy of Shawn Hall’s excellent book, “Romancing Nevada’s Past, Ghost Towns and Historic Sites of Eureka, Lander, and White Pine Counties,” which available in local bookstores or from the Tonopah Historic Mining Park online gift shop, http://www.tonopahnevada.com/giftshop.htm. Prospect wasn't the most successful mining camp in Eureka County but it managed to outlast most of its contemporaries. Settled in 1885 by miners working in the mountains south of Eureka, Prospect was a bit unusual in that there were no significant mines in the immediate vicinity of the camp. The town essentially served as a residential and supply center for area prospectors. As a result, Prospect never had more than 100 or so residents. A post office was opened in 1893 and by the early 1900s, the town had a saloon, a school, several boardinghouses and a small smelter. Historian Shawn Hall notes that supplies had to be brought in to the town by stage from Eureka three times a week. An old U.S. Geological Survey photograph of Prospect from 1908 shows a quiet hamlet containing perhaps two dozen wooden buildings—none particularly fancy—with the two-stack smelter and mine buildings in the background. The camp muddled along for about a decade until the silver ore ran out. The miners moved on and the post office closed in April 1918. The camp was silent until the early 1980s, when mining started up again on nearby Prospect Peak. Several metal buildings were erected to house mining operations and the Diamond Mine, a horizontal shaft drilled directly into the mountain, was reopened. The mine ceased operating a few years later and the site remains closed to the public. During a visit (after asking permission from a local caretaker), we found a ghostly mining camp that still had the appearance of being able to reopen at a minute’s notice. The Diamond Mine still boasted ore carts on tracks in the tunnel and an extremely cold, refreshing breeze emanated from within—natural air conditioning in the summer months. Beyond the newer mining buildings, you could find remains of early operations such as the rusted metal and cracked concrete ruins of a large furnace. Additionally, at the base of huge tailing piles, you can see large sections of cable, a huge flywheel and other mining trash on the site. Below the mine in a flat, you can still see a handful of fairly intact wooden and metal buildings, probably built around 1908, which once housed local miners. One of the structures still contains a few furnishings, such as tables, cabinets, curtains, scattered cans and other “objects de mining.” Its neighbors, however, show the wear of the years; it’s amazing they remain standing. If you close your eyes, imagine for a moment that your car isn’t parked nearby, then look out across the old town site at the tailing piles, sagebrush-dotted hills and the mine, it’s not too difficult to evoke a sense of living in this isolated little camp. There are a fewer buildings than in the old photo, but the shape of the land and general atmosphere remains relatively unchanged. And when the wind picks up, you almost swear you can hear the ghosts talking of better times and how they probably ought to think about moving on. As with the mine, the town site is on private property, so don’t explore without first getting permission from the caretaker (he resides in a wooden house that is in much better shape than the others). One thing that old inhabitants of Prospect probably never paid much attention to is the spectacular view. From Diamond Mine, you can look out across Secret Canyon and see the panorama of the surrounding mountains and Diamond Peak in the distance. Prospect is located in Central Nevada about five miles southeast of Eureka. To reach it, pass through Eureka and continue on U.S. 50 east for 1.5 miles. Exit right on Secret Canyon Road for 2.5 miles to the site of Prospect. For more information about ghost towns in the Eureka area, contact the Eureka Opera House, 775-237-6006. Since 1993, Wally Cuchine has been bringing culture to the historic mining town of Eureka. Cuchine, executive director of the Eureka Opera House, has made it his goal to present a diverse menu of entertainers ranging from Celtic pipers to cowboy poets. “It has been my opinion that you should have an eclectic mix of performers,” he says. Sarah Sweetwater, who teaches at Elko’s Great Basin College, sometimes drives two hours to attend events at the Eureka Opera House. She says she is impressed by what Cuchine has accomplished. “If it weren’t for people like Wally, we in rural Nevada would be starved culturally,” she says. Originally from East Helena, Montana, Cuchine has been a Nevada resident for more than three decades. He discovered Eureka, the historic mining town located 242 miles east of Reno, in the early 1980s when he was hired to measure air quality in the region. “While I was here, I fell in love with Eureka,” he recalls. “I always knew I could come back here someday.” His chance to return came in 1993, when he was tapped to run the opera house after two successful years as executive director of the Bristlecone Convention Center in Ely. Built in 1880, the Eureka Opera House originally served as a miner’s union hall and later as a movie house. By the late 1980s, however, it was in need of restoration. The opera house was acquired by Eureka County, which spent $2.5 million, mostly from taxes generated from the county’s gold mines, to renovate the two-story, red-brick building into a convention center and performing arts theater. When he was hired, Cuchine says the Eureka County commissioners provided him with a generous budget and told him to bring in performers he thought the community would like to see. During the last few years, the opera house has hosted country-rock performers like Eddie Rabbitt (who was the first performer to appear in the revamped opera house), Western singers such as Don Edwards, Celtic bands, jazz groups, contemporary poetry readings, mystery theater, local school plays, and visiting children’s theater workshops. Cuchine requests that anyone who performs in the Opera House, including members of children’s groups, sign his or her name on one of the backstage walls. “My dream is someday these kids who do sign the wall will bring their kids to see where they signed,” he says. One of Cuchine’s passions is Nevada art. His home is jammed with paintings, posters, statues, and prints depicting Western themes and Nevada landscapes. In 2005, a portion of his massive art collection was displayed at the Nevada Historical Society in Reno. 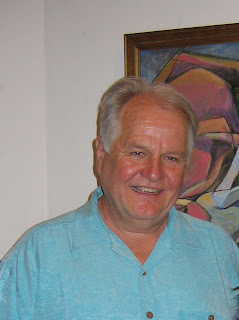 His plan is to one day develop a permanent gallery for his artwork in Eureka. Naturally, Cuchine is proud of the opera house that he’s helped to nurture for nearly a decade. “This is a wonderful, intimate place to see a performance. I like to tell people that we’re the center of everywhere [in Nevada] and everyone should come here to enjoy a performance,” he says. For information about the Eureka Opera House, including the schedule of upcoming events, call 775-237-6006. 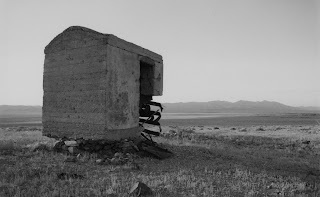 A rectangular, concrete vault perched precariously on a crumbling rock foundation is just about all that remains of the old mining town of Fairview, located 40 miles east of Fallon on U.S. 50. Rich silver deposits were discovered in Fairview in 1905. A major mining boom kicked off a year later when Nevada mining investors George Wingfield and George Nixon (both involved in developing Goldfield and several other Nevada mining camps) purchased several claims in the district. By June 1906, a town was laid out and lots were sold. During the next year, thousands of people drifted into and out of the camp, which was soon had several hotels and banks, two dozen saloons, and two newspapers (the Fairview News and the Fairview Miner). Because of its remoteness, basic commodities were expensive in Fairview. Nevada historian Stanley Paher notes in his “Ghost Towns and Mining Camps of Nevada” that a plot of sagebrush and sand sold for $100 a front foot, while ice was $4 per 100 pounds, water was $2.50 a barrel, and wood was $20 per cord. In 1907, enthusiasm about Fairview was so great that there was widespread discussion about a railroad connection. According to rail historian David Myrick, the most common rumor was that the Nevada Central Railroad, which ran from Battle Mountain to Austin, would go westward to Rawhide, with a spur to Fairview. But, unfortunately for the town, no railroad was ever built. Photos from the time show a fairly substantial community laid out in the desert flat below Fairview Peak, overlooking the Fairview and Dixie valleys. The town was several blocks long and wide, with a wide main street lined by about a dozen stores and businesses, including a two-story hotel. Since there wasn’t rail service, freight, including supplies needed by the town and ore that was sent out of the area for processing, was handled by several auto stages that linked the community to Hazen and Fallon. Despite the early optimism and the development of a fairly large community, the Fairview area mines began to decline in 1908. The newspapers folded and most of the miners moved to more lucrative districts. Modest discoveries in 1911—the district produced a total of about $3.8 million in its short existence—spurred another small boom. Much of this new development clustered around the large Nevada Hills Mill built on the mountain behind the original town site. Mining continued until about 1917. However, by the 1920s only a handful of hardy optimists remained in Fairview. The original town site, which was in the flat below the mines, began to disappear. Wood from many of the buildings was used in the upper town site or taken for use in other towns. The mill building was dismantled after it was closed, leaving only foundations. 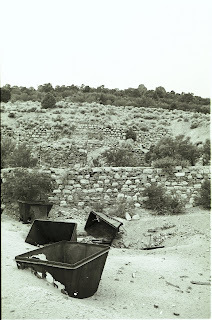 Photos from the 1950s show about a dozen, dilapidated buildings still standing in the upper canyon. But even these didn't have much of a chance of surviving. In the early 1980s, pilots from the nearby Fallon Naval Air Station bombed the wooden structures, apparently believing they were practice targets. Today, the only noteworthy survivor is the decaying concrete bank vault standing alone on the flat site of the original town. The solid block, open at one end (and definitely not safe to enter), rests on a deteriorating base of natural rock. Ironically, as you stand on the site of the town, you realize that Fairview also describes the community’s most lasting legacy—the spectacular view of the surrounding valley. When you first see Scotty’s Castle on the edge of Death Valley, you almost feel like rubbing your eyes to make sure it’s not a desert mirage. Built in the early 1920s as a vacation home by a wealthy insurance magnate named Albert M. Johnson, the castle might best be described as a smaller version of the famous Hearst’s Castle. Like Hearst’s mansion, Johnson’s castle is filled with antiques and exquisite architectural features. The story behind Scotty’s Castle is intriguing. Just after the turn of the century, a colorful miner named Walter E. Scott—or “Death Valley Scotty”—who had spent many years prospecting in the Rhyolite-Death Valley area, befriended Albert Johnson. Stories indicate that Scotty suggested Grapevine Canyon as the site for Johnson’s vacation castle. The location had water and a commanding view of Death Valley. Soon, a massive multi-story Spanish-style stucco and tile mansion was built on the desert’s edge. Albert Johnson spared no expense in building his castle. Elaborate turrets rise above the dozens of rooms in the compound. Inside, he filled the place with rustic, handmade southwestern furniture, wall hangings and other accents. During nine years of construction—the castle cost between $1.5 and $2 million in 1920s dollars—Johnson incorporated a few advanced design features. For instance, there is a ceiling to floor waterfall in the front room. In addition to its aesthetic qualities, the purpose of the waterfall is to help cool the house, which was built before the invention of air-conditioning systems. Additionally, Albert Johnson experimented with a series of fans blowing air across large ice blocks into an underground vent system —an early attempt at air-conditioning—as well as with a crude version of a solar heating system. When the complex was completed, Johnson and his wife named it the Death Valley Ranch. Albert Johnson, however, had a mischievous streak. Since Death Valley Scotty was a frequent guest, the two would often tell people that Scotty was the owner and Johnson was simply a visitor. 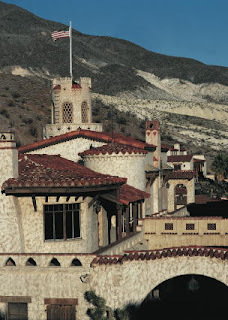 Within a short time, most people referred to the complex as “Scotty’s Castle” rather than its real name (in fact, most folks believed that Scotty was the owner and had built it from his mining earnings). By the late 1920s, the castle had become a haven for America’s celebrities, with the Johnsons and their official “host,” Scotty, entertaining many of the world’s richest and most famous people. The castle was never completed because Albert Johnson’s fortune was diminished as a result of financial losses he experienced during the Great Depression in the 1930s. After Johnson’s death in 1948, Scotty was allowed to live at the ranch for the remainder of his life. He died in 1954. Following Mrs. Johnson’s death, the massive home was bequeathed to a religious organization, which opened it for tours during the 1950s and 60s. In 1970, the U.S. government acquired the property and incorporated it into Death Valley National Park. Today, park rangers offer daily guided tours. At several points, you encounter park service staff dressed as famous visitors from the 1920s and 30s, like director Cecil B. DeMille, who act in character to tell you about the place and their personal experiences with the Johnsons and Death Valley Scotty. You will also see the large multi-car garage, complete with a vintage 1920s auto. It’s easy to imagine it filled with a half dozen or more large vehicles owned by the stars who were frequent guests, such as humorist Will Rogers. Another special treat is the room housing Mrs. Johnson’s massive pipe organ. The organ, now automated to play dozens of tunes, fills an entire wall of the room. Adjacent to the main house, visitors will also see a partially built swimming pool as well as a large tower, also not finished, which was to house a power plant for the complex. Scotty’s Castle is located about an hour northwest of Beatty, Nevada via U.S. Highway 95 and State Route 267. The castle is operated by the National Park Service, which offers daily tours and publishes an excellent map brochure about Death Valley and Scotty’s Castle. For more information, contact the Superintendent, Death Valley National Park, Death Valley, CA 92328, 760-786-2331. On May 31, 1950, the Virginia & Truckee Railroad made its final run. The rail line, which had started operating in 1869, had been on life support for more than two decades. In the 1940s, the owners began to sell off the most historic equipment, with much of the rolling stock going to Hollywood studios to be used in westerns. In 1949, the state gave permission for the company to cease operating. Within a few years, the rails had been pulled up and sold for scrap. Many of the former depot buildings and the maintenance facilities were abandoned or neglected. It appeared that the V&T, as it was known, would become a quaint historic footnote. That, however, isn’t the end of the story. In the early 1970s, a California businessman and train buff, Robert C. Gray, began gradually rebuilding the V&T route downhill from Virginia City. By the 1990s, Gray operated a tourist railroad with a vintage steam locomotive (not an original V&T engine) that traveled from a small depot on F Street, just south of the St. Mary's in the Mountains Catholic Church, to the Gold Hill Depot, which Gray helped renovate. The round trip, 35-minute train ride traveled a little under six miles and passed through several reconstructed tunnels. During the leisurely ride, travelers enjoyed an informative talk as the conductor related Comstock stories and pointed out places of historic interest along the way. In the early 1990s, V&T enthusiasts along with Storey County, Carson City, and state officials began studying the possibility of reconstructing the historic rail line all the way from Virginia City to Carson City. A financial study indicated that the railroad was feasible and the non-profit Nevada Commission for the Reconstruction of the V&T Railroad was created to raise money for the project, estimated to cost $25 million when completed. In 2005, the project picked up steam when the Nevada Department of Transportation awarded a $3.8 million contract to extend the railroad south from Gold Hill. The contract included filling in the Overman Pit, which had blocked previous efforts to lengthen the railroad (the large open pit mine had been dug after the railroad was abandoned). The Nevada Legislature provided additional funds to help keep the project going while the Department of Transportation donated a railroad bridge formerly used in Southern Nevada for a crossing over U.S. 50, once the rebuilt railroad reaches that point. 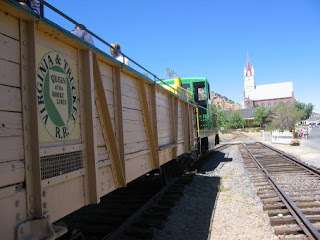 The reconstructed railroad will closely follow the original railroad right-of-way between Virginia City and Carson City. It will incorporate the Virginia and Truckee Railroad Company’s 2.5 miles of existing track from Virginia City to the Gold Hill Depot. From there, it will cross the filled-in Overman Pit and continue through American Flat, a former mining mill district near Silver City, before reaching U.S. 50 near Mound House. The route crosses the highway and enters the Carson River Canyon area, where it winds along the banks of the river, offering spectacular views. It will conclude its 21-mile route in Carson City. Railroad officials hope that the first leg of the expanded rail line, Gold Hill to U.S. 50, will be completed by 2009. In the meantime, Gray continues to offer rides on the first portion of the route. His train operates from Memorial Day until the end of October. Cost is $6 for adults, $3 for children 5-12, children under 5 free, and an all day pass is $12. For more information call 775-847-0380. The V&T’s history is intertwined with the story of Virginia City’s mining industry. Built in 1869, the Virginia & Truckee was the brainchild of banker William Sharon, the Bank of California’s representative in Virginia City. The 21-mile Virginia City to Carson City leg of the railroad was completed in November 1869, with the Carson City to Reno extension finished in August 1872. The V & T’s fortunes began to wane with the decline of mining in the Virginia City area in the 1880s. By the turn of the century, the railroad had shifted its focus from transporting ore to carrying tourists and other passengers. In 1906, the V & T was extended south of Carson City to Minden. The railroad’s financial situation worsened after 1924, when mining had virtually stopped in Virginia City. 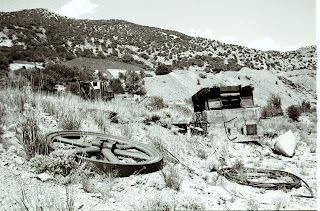 The railroad struggled to stay in business during the next 26 years (with the unprofitable Virginia City to Mound House spur shut down in 1938), losing money in each succeeding year. In 1950, the line was formally abandoned. But, in the words of Mark Twain, who also spent a lot of time on the Comstock, reports of its death were greatly exaggerated.